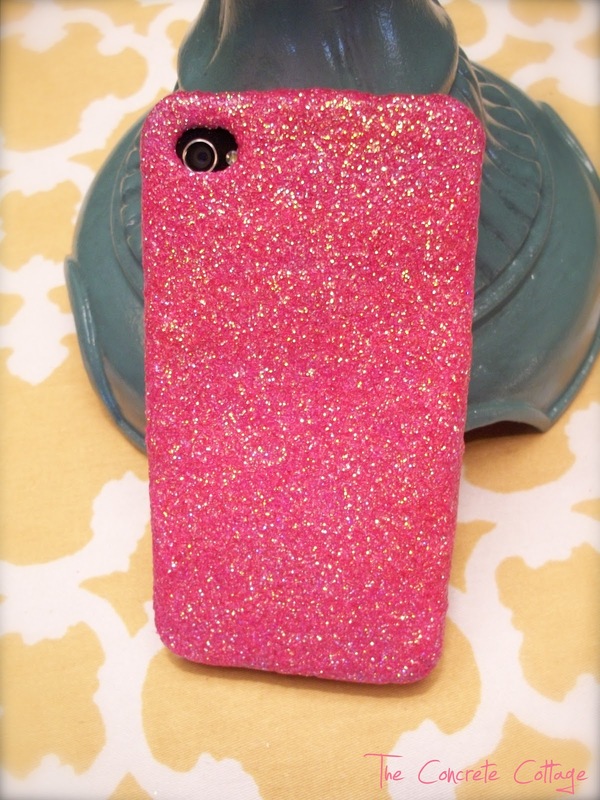 It's pink, sparkly and girly!! My little man HATES it. Tee hee hee! I bought a silicone mint green case for my iPhone last Christmas ("why just order one for the kid when you can order an extra for yourself", I always say). It soon went from a sweet pastel mint to what I guess you might call "chocolate mint". I liked the contact paper I used to line the drawers in my daughter's vanity makeover, so I decided to try covering the case with it. The second pic is after four months of contact paper use. Worked great, but the edges started to look a little antiqued. Great for furniture, not for iPhone's! Enter Glitter, Glue & Nail Polish!! 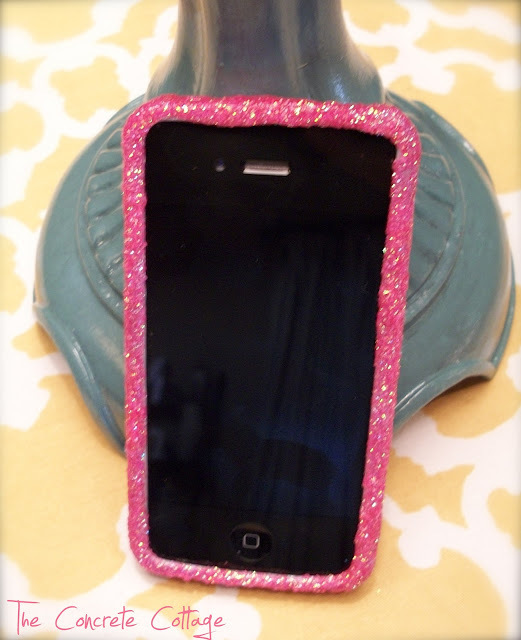 After seeing about a hundred Pinterest tutorials showing how to glitter everything from phone cases to jack-o-lanterns, I finally decided to tackle it myself. Choose the finest glitter you can find for the best result. 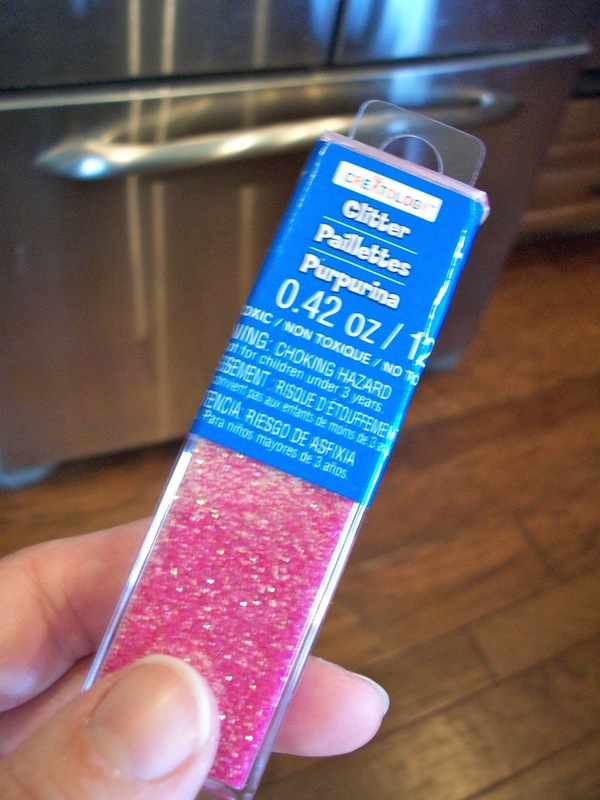 I picked up this pretty pink glitter at Michael's today for $1.29 and went to work. I mixed up some cheap school glue and water (what any good cheapskate would do when all the tutorials call for Mod Podge) and painted the mixture on my case. Then it was just a matter of dumping all that glitter onto my now slimy, glue covered case. I shook the excess off into a bowl so I could easily spoon it out and use it again. 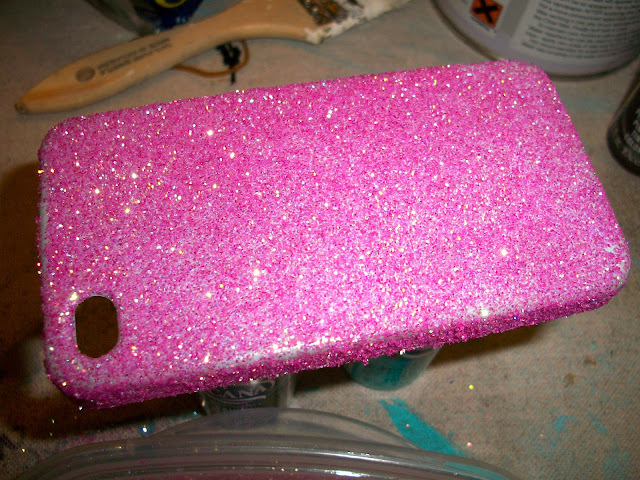 This is after one coat of glue and glitter. It took two coats to completely cover. Bottom half already covered in nail polish. To prevent the inevitable glitter infestation (how does it always end up down my bra?) I coated the whole mess in clear nail polish. I know there are several other things I could have coated it with, but I had the nail polish, and... I'm CHEAP! I am a bit worried about how well it will hold up over time. Will it all peel off in one piece? Will it stick to that case like Concrete?!? Update: It's been just a few days shy of one month since I "Blinged my iPhone" case and it looks exactly like it did when I took these pics! No peeling whatsoever!!!! I do see the occasional piece of glitter here or there, but even that is rare. So, happy blinging!! 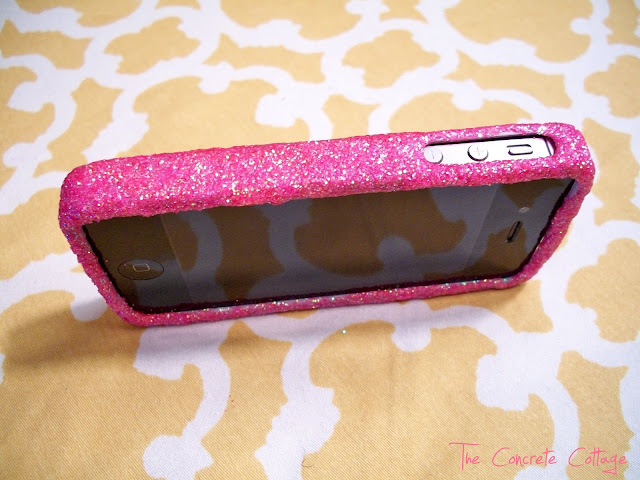 I love this , my hubby brought me the pink case but it needs a little jazzing up. This is going on my list of projects,right after those lamps you made. 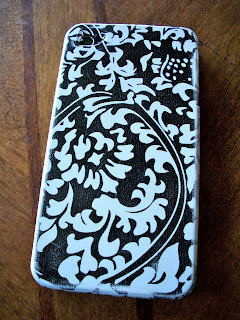 Wow - I don't think I have the guts to bling out my iPhone, yet yours turned out so darn pretty... I may end up trying this! 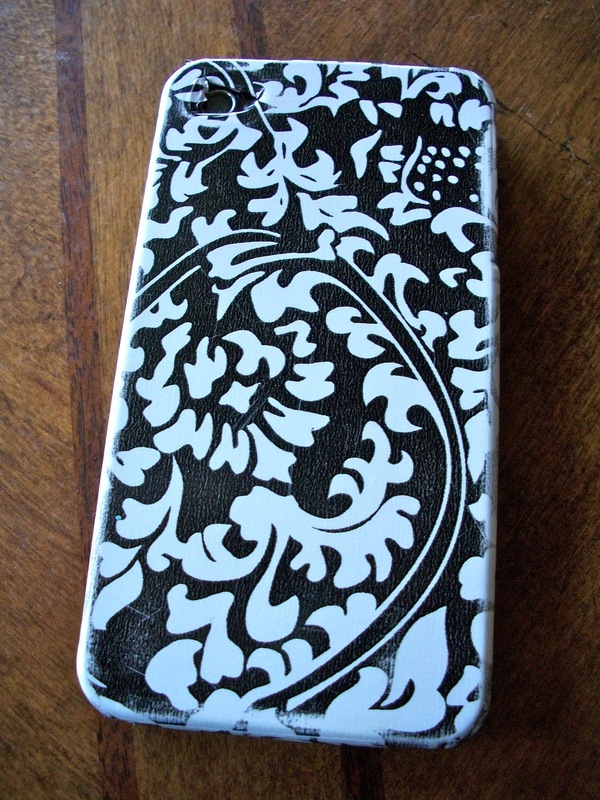 Love how your phone looks now! Great job...but I would wonder to if it would hold up. You're braver than I! Now that's what you call bling! Fancy, and oh so cute. Thanks for sharing with the newbie party. Enjoy! Love it! Thanks for sharing at the Creative Corner Hop. hope you have a moment to drop by and do check out my giveaway on the sidebar. Looks great!! I tried a similar idea a couple of months ago, only I used some glitter glue that I had around the house. A couple of days later the whole thing peeled off in one piece :( I should have added nailpolish over the top! I've use modpodge with success as well. HI! Visiting from Sugar Bee. 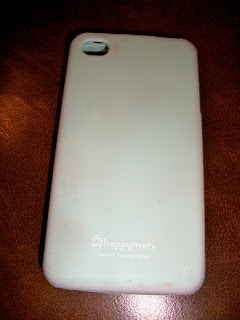 Love your case! 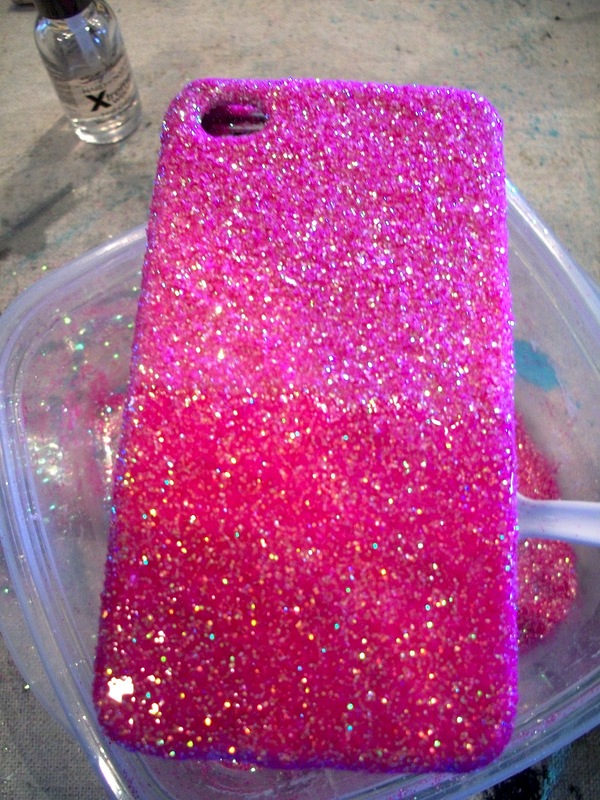 I need to do this for mine.. but like you Im nervous about the glitter going everywhere. I should just jump in and try it. Love your color too! I was wondering the same thing: How it will hold up. It's pretty cute though! I want a blinged out phone case! It's fabulous and mine is boring! I may need to rush out for some glitter at midnight so I can be as fabulous as you! In fact, this would be perfect for our Crazy About Color link party on July 31! Beautiful!!! I love how it turned out thanks for sharing. I think I need to go and do it too. Love that hot color. Nice job. So pretty! I love pink and I love glitter! Great combo! =) Thanks for sharing at the Pomp Party! Pinning to our Pomp Party board! I am so going to glitter one of my tablet cases this weekend now!!! That is awesome. Thank you for sharing this super fun idea at our party: http://www.FineCraftGuild.com and thank you for linking back from your post. Such a refreshing politeness. It makes me happy. 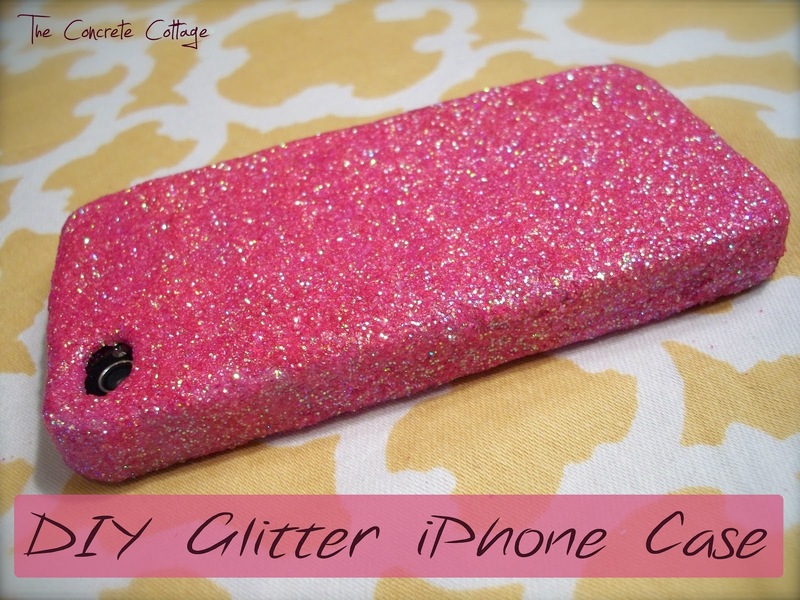 love your girly and glitter case! I painted mine in grey ( here: http://cimancasoloilcaminetto.wordpress.com/2012/11/19/nulla-si-crea-nulla-si-distrugge-tutto-si-trasforma/)but soon I'll add glitter too! girls deserve to sparkle! No Bedside Lamp for Me, NO way, NO how, not EVER! A Few Thrifty Kitchen Finds!